You can delete and edit your Deployment and re-create it anytime before you launch it to cloud. 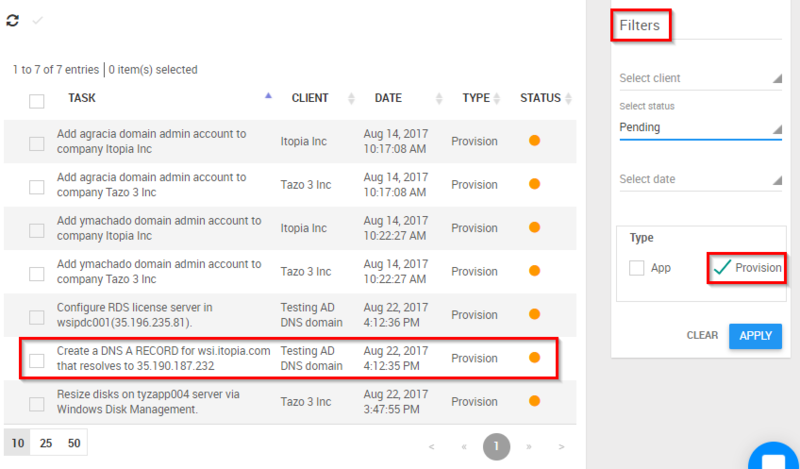 After you login to https://cas.itopia.com/ select the deployment on the left. You will get the screen to continue your deployment. Instead of continuing, click Cancel button and you will get an option to delete the deployment. 1./ Always do it from itopia, never from Google Platform, since itopia software will take care of deleting the deployment from Google and also removes the servers that were deployed with the Project. 2./ Provision tasks must be completed to see the option to delete the deployment. After the Deployment is launched, there are 2 provision tasks to be completed before you get the Delete option available. If you still see the Provisioning status window (picture below) in your deployment dashboard, it's a clear indication that the mentioned tasks need to be marked as complete first. Go to Tasks and filter them by Provision. Note: The system doesn't validate if you complete the tasks in the server/ domain, therefore, in case you want to delete the deployment, you can mark the tasks as complete even if you haven't finished the setup. After that, go back to the deployment dashboard. Provision Steps window will disappear and the Delete option can be found on the top right under the three vertical dots. The system takes 2 hours to complete the deletion. Just click the STOP button to stop deployment deletion. While this process deletes the VM instances in GCP, Google doesn't clear the static IP's that belonged to those VM instances. They need to be manually released otherwise Google keeps charging for them. Follow this article to learn how to release static IPs.